BERLIN, GERMANY – OCTOBER 10: “More than 250.000 protesters gather to demonstrate against the TTIP and CETA trade accords on October 10, 2015 in Berlin, Germany. Critics in Germany oppose the accords for a number of reasons, including fears over genetically-modified foods, environmental standards, workers’ rights and pharmaceuticals.” Photo is by Axel Schmidt/Getty Images. The Transpacific Partnership or TPP, the trade agreement among 12 Pacific Rim countries that has been secretly negotiated and just released on November 5th would likely make Joseph Goebbels and Edward Bernays proud if they were alive today. It is one of the biggest pieces of shameless propaganda disguised as a “free trade” agreement that currently exists. As Noam Chomsky has pointed out, the agreement isn’t even about free trade. It is far more of an “investors rights” agreement. It began as the Trans-Pacific Strategic Economic Partnership Agreement signed by Brunei, Chile, New Zealand, and Singapore in 2005. Three years later Australia, Canada, Japan, Malaysia, Mexico, Peru, the United States, and Vietnam joined the agreement and expanded its reach even further. The preamble of the document begins as typical, capitalist, “free market” propaganda does. They declare all parties involved are committed to all the right concerns like public safety, jobs, sustainability, welfare, the environment and so on, but it then it goes onto to explain how exactly they will erode our power to regulate corporations to ensure that they don’t destroy all these facets of our world simply because of their greed. As is the case with various other “free trade” agreements, the TPP ensures a “race to the bottom” of environmental and labor standards to attract foreign investment from unscrupulous, rich corporations. Even parts of the preamble foreshadow the more dystopic provisions of the TPP like this paragraph, which states one of the goals of the TPP is to “AFFIRM that state-owned enterprises can play a legitimate role in the diverse economies of the Parties, while recognising that the provision of unfair advantages to state-owned enterprises undermines fair and open trade and investment, and resolve to establish rules for state-owned enterprises that promote a level playing field with privately owned businesses, transparency and sound business practices.” Giving state-owned enterprises advantages in the marketplace can be very positive. For example, nationalizing vital resources and distributing them freely or at a very low cost can save countless lives. The corporations that sell those resources can lose money in this process but that should not be a concern of the government or the people. Corporations should not have a level playing field with governments. Governments are supposed to operate to fulfill public interest and although they often don’t, the public at least has a say over their affairs and can make them accountable, whereas corporations have absolutely no obligation to serve public interest and purely operate for profit. They are a potentially more dangerous form of authority than governments for this reason. Typical in capitalist propaganda, the term “free trade” in the TPP refers to the supposed “freedom” and “right” corporations have to extract as much resources as possible from the Earth for profit, regardless of the cost to everyone else. Of course, there are good reasons regulations on corporations exist and while the state is not particularly effective at regulating corporations or enforcing these regulations, (Obama’s enthusiasm about the TPP and his record of crony capitalism is proof alone of this) many of the regulations on corporations that are in place right now are important because they do protect us and the environment (albeit in limited ways). They should exist so long as governments do. There are good reasons the EU has enacted labeling laws, laws against GMOs, neonicotinoids, chlorinated chicken, hormone treated meat, and cloned cattle. They are dangerous to public health, animals, and the environment. GMOs have been shown to be linked to noncancerous tumors, cancer, and autism. In one study 50-80% of all females rats fed GMO corn and roundup in their water developed tumors in 24 months and 70% died.1 Most GMOs are also designed to withstand the endless pesticide treadmill that enriches large agrochemical corporations like Monsanto, which spray their poison everywhere, pollute the water and soil, and sue farmers for “copyright infringement” when their GMO pollen infects and pollinates farmers’ plants. Over 60 countries have banned the use of GMOs and the EU has restricted the use of neonicotinoids because they cause honey-bee colony collapse disorder and kill other pollinators, including birds that rely on the insect population as a food source. Pollinators are responsible for pollinating 2/3 of the world’s food. Without them billions of people would die. Yet these ecocidal, parasitical, synthetic pesticide manufacturers like Bayer and Syngenta continue to peddle this poison because it makes them billions as consumers of the product don’t know any better. One type of neonicotinoid called Imidacloprid is the most widely used insecticide in the world even with these restrictions in place. Corporations are succeeding in arguing the world is theirs for the taking and that their profits made by any means necessary trump public safety and the Earth we live in importance while at the same time touting how “committed” they are to public safety, jobs, welfare, the environment and so on. The TPP could be summed up as follows: The world belongs to corporate monopolies, corporate powers supersede all other laws, corporate profits are the most important concern in the world, and if you stand in our way we will use our legal armies to bury you. They are arguing they have this power by using the hegemonic World Bank’s tribunals that only apply to them with the investor-state dispute settlement (ISDS) provisions of the TPP and other trade agreements. Corporations get to decide which court and rules to use when suing under ISDS provisions. World Bank tribunals are one example but they can also chose to litigate in the International Chamber of Commerce or the United Nations Commission on International Trade Law. Corporations have already begun suing for “lost profits” they would have made had sensible laws restricting their destruction not been enacted. 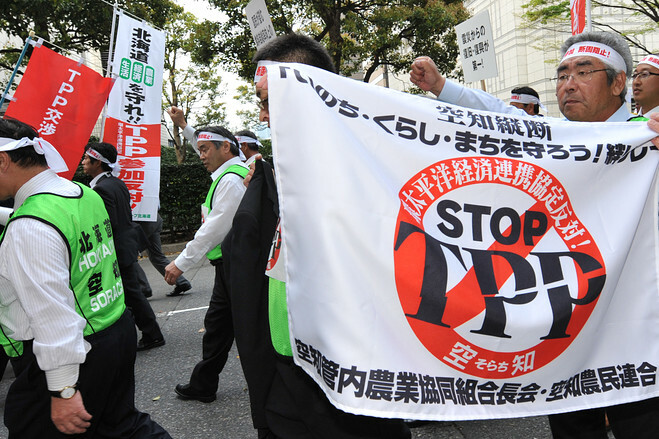 The TPP says these tribunals will be open to the public. However, the TPP also states “If a disputing party intends to use information in a hearing that is designated as protected information or otherwise subject to paragraph 3 it shall so advise the tribunal. The tribunal shall make appropriate arrangements to protect such information from disclosure which may include closing the hearing for the duration of the discussion of that information.” Because they decide what qualifies as “protected information” they could argue the bulk of the case is “protected” and therefore closed to the public, limiting our ability to know what they are even suing for or what is at stake. ISDS is not new. It was first used in a bilateral trade agreement between Germany and Pakistan in 1959 as Germany sought to protect its companies from potential losses caused by Pakistani expropriation of German investments in Pakistan.2 But ISDS has never before been used so frequently and so broadly as more corporations have realized it can be used to make enormous profits and circumvent environmental laws. Of the environment the TPP claims to be committed to its welfare, but it also says “The Parties further recognise that it is inappropriate to establish or use their environmental laws or other measures in a manner which would constitute a disguised restriction on trade or investment between the Parties.” The whole purpose of environmental laws is to prevent investments in environmentally destructive practices, so there might as well be no environmental laws if they can’t be used to prevent such investment. The World Bank’s tribunals have the power to declare what constitutes a “disguised restriction” on trade so they could decide that oil that governments have decided must be left in the ground to limit contributions to global warming is not really an environmental protection but rather a “barrier to trade.” In fact, Lone Pine Resources did just that in 2012 as will be explained. The TPP also states that countries can only institute a forest or agricultural safe guard measure if “the aggregate volume of [agricultural or forest] imports of those originating goods” exceeds a certain number of metric tons or square meters that they deem appropriate. These numbers are to increase every year and they are listed in the TPP. As stated companies have already begun suing governments for damages for laws that prevent their ecocidal practices using other free trade agreements, of which there are over 3000 that govern international, investor-state disputes. For example, in 2012 Canadian company, Lone Pine Resources, sued the Canadian government “under Article 1117 of the NAFTA [North American Free Trade Agreement] for the arbitrary, capricious, and illegal revocation of the Enterprise’s valuable right to mine for oil and gas under the St. Lawrence River by the Government of Quebec without due process, without compensation, and with no cognizable public purpose.“3 Lone Pine Resources moved its headquarters to America just to sue under the American trade agreement for $250 million. (Apparently, it didn’t matter their headquarters was in Canada at the time the fracking restriction was enacted,) Of course, there was a very cognizable purpose for restricting their fracking, despite the company’s claims. The government was trying to prevent pollution of the St. Lawrence River, other local water sources, and soil, and limit carbon dioxide in the atmosphere but such concerns aren’t important to corporations like Lone Pine Resources who worship nothing but the “all mighty dollar.” NAFTA, the agreement used to sue, has also killed 700,000 jobs in the US and increased poverty in Southern Mexico where these American jobs were outsourced, at first creating many jobs in Mexico that vanished as soon as the WTO invited these corporations to outsource the same jobs to China where labor protections are even weaker. The same is likely to occur with the TPP in Vietnam where “labor unions are illegal and workers are paid one half to one third of what Chinese workers are paid.”4 There are also many provisions in the TPP that exclude Vietnam and other smaller signatories like Brunei and Malaysia from protections in place. Of course, they will get the raw end of the deal and be explored primarily as sources of cheap labor and resources. ISDS is also being used as an instrument to affect public policy. For example, the Renco Group owned by billionaire Ira Rennert sued the government of Peru over lost profits when the state shut it down due to its pollution in the city of La Oroya on the Mantaro River in central Peru. To avoid being sued, the government allowed the smelter to begin its operations once again. Most lawsuits under ISDS provisions are filed under similar circumstances. When governments attempt to stop corporate destruction and pollution of the environment, these international giants sue for “lost profits.” As another example of this, in 2011 after the Fukushima nuclear disaster the German government decided to shut down its nuclear power plants and focus on greener source of energy. In response, Vantenfall, a Swedish utility company that operated two nuclear plants in Germany sued for $6 billion under an ISDS provision. The government of Ecuador was also sued for $1.77 billion (including interest the figure was $2.3 billion) by US oil giant, Occidental Petroleum, when the government terminated their contract in 2006 because they violated a provision of the contract by selling part of their oil exploration concession without the approval of the government. Exxon Mobil also sued Venezuela for nationalizing oil projects in 2007 and received $1.6 billion from the country in 20145, and it’s not only energy companies that have taken advantage of these ridiculous “free-trade” agreements. In 2010 Phillip Morris sued Uruguay for $25 million under the bilateral investment treaty between Switzerland and Uruguay for its anti-smoking legislation, claiming that it “devalued their trademarks.” Phillip Morris also filed a similar suit against Norway for its ban on the display of tobacco products, which it fortunately lost. Australia enacted similar laws along with legislation that requires the plain packaging of cigarettes that warns consumers of the dangers of smoking, and in 2011 Phillip Morris sued Australia for these laws under the Hong Kong bilateral investment treaty with Australia. (The US tobacco giant had to shift its assets to China just to be able to sue under the Chinese treaty with Australia.) It lost this case as well, but it didn’t stop them from continuing to sue several other countries for similar laws. More recently, Phillip Morris and British American Tobacco filed suit against Britain for plans for plain packaging laws in 2015, seeking $17.1 billion dollars. With all of these lawsuits, a question arises: what if the government were to criminalize tobacco? Would they still seek compensation or more of it since they consider selling the most lethal substance on Earth as some kind of right? When Bayer legally sold heroin in America in the 19th century, no corporate lawyer at Bayer ever considered suing the government for making the substance illegal. Certainly, this would have been laughed off, just as a drug lord trying to sue a government for the decriminalization of cocaine would be. But what these litigious corporations are doing is no different. They just have the legal teams, lobbyists, and PR people to make many people believe all of this is rational. Mining companies have also sued governments under the same free-trade agreements for restricting them from mining protected land. In 2015 Pacific Rim, a Canadian Gold company now owned by OceanaGold sued El Salvador for $301 million, half of its national budget for not allowing gold to be dug up within its borders prompted by concerns about drilling poisoning the water.6 The country has already spent $6 million in court defending itself. According to Pacific Rim, clean drinking water is not a right for El Salvadoreans but making a profit digging up their gold and poisoning their water is a corporate right. This “logic” is nothing short of ecocidal, pompous, deluded, misanthropic, and psychopathic.. 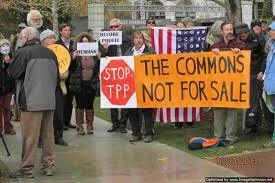 The TPP also aims to eliminate tariffs for trading across borders of the countries involved. Tariffs can ensure local economies grow instead of importing the cheapest products possible made with child labor, slavery, or under deplorable working conditions abroad, so these provisions eliminating tariffs could be potentially very harmful. The TTIP or the Transatlantic Trade and Investment Partnership, a companion agreement to the TPP is perhaps even more dystopic, as is the TiSA or the Trade in Services Agreement, which covers 70% of the global services economy and aims to privatize banking, health care, and transport. The CETA or Comprehensive Economic and Trade Agreement between Canada and the EU is another “free trade” disaster being negotiated right now with provisions about copyright infringement similar to those in the TPP, ACTA (Anti-Counterfeiting Trade Agreement), SOPA, and PIPA. CETA also sets up investor-state tribunals, which allow corporations to sue governments for “profit losses” and do not give states or people the same ability. To stop TPP, TTIP, TiSA, CETA, and other free-trade disasters we must fight the world’s hegemonic, imperialistic corporations, secretly sabotage and destroy their operations, and boycott them. We must target the World Bank tribunals and other ISDS sham courts, and we must hit them in their wallets, destroying their capital and infrastructure. The cost of doing business must be made untenable as we destroy their infrastructure before they can even finish building it.